Gourmet magazine has come to an end. When I read that the 68 year old magazine was closing up shop, I cried. I did. I sat there in a coffee shop and shed a few tears. The last issue arrived this week. November 2009. I flipped through the beautiful pages and read each recipe several times. There are some gems this month, but this Crab Hush Puppy recipe made me say ‘wow’ outloud. I am grateful for this magazine and the delicious appreciation of food it has brought into my life. Make hush puppies: Preheat oven to 200 F.
1. Heat 2 incoies oil to 375 F in a wide 5 qt heavy pot over medium heat. While oil heats, mince and mash garlic to a paste with a pinch of salt, then whisk together with eggs, buttermilk, and scallions in a bowl. 2. Whisk together cornmeal, flour, baking powder, ¾ tsp salt, and ½ tsp pepper in a large bowl, then stir in buttermilk mixture until just combined. Stir in crabmeat. 3. Working in batches of 10, carefully drop tablespoons of batter into oil and fry, turning occasionally, until golden-brown, about 3 minutes per batch. Transfer to a paper-towel-lined baking sheet and keep warm in the oven. Return oil to 375F between batches. 4. 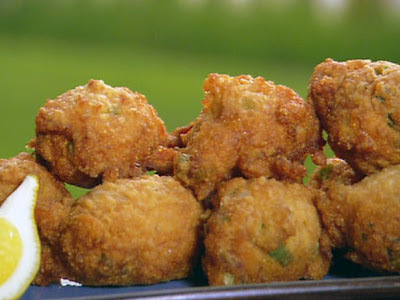 Serve hush puppies with tartar sauce. Tartar sauce can be made 2 days ahead and chilled. Hush puppies can be fried 5 hours ahead and chilled (covered once cool.) Reheat in 1 layer on a baking sheet in a 450 F oven, about 10 minutes.